Fabulous and fascinating, this delightful ball gown dress 89232 is a perfect choice for your quinceanera. Showcasing a subtle sweetheart neckline edgy detachable off the shoulder cap sleeves give this gown a dynamic effect. 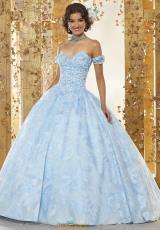 Glamorous three dimensional flowers adorn the corset bodice, while shimmering crystals add a pop of glitz and sparkle. Made in a regal organza fabric, the full ball gown skirt highlights a rich embroidered detailing that is simply enchanting.